Fairly early in the Venom film, the Life researchers discovered that sound of a certain frequency disabled the symbiotes. However, they fruitlessly sent agents, cars, dune buggies, and explosive drones to try and capture Venom. Why did they do this when a loudspeaker would have been so much more effective? Why does someone who's being hunted by a killer always have bad/no phone signal and usually a dead battery... because modern technology is so powerful a tool being able to be used anywhere anytime and get help/support within minutes usually needs to be rendered useless otherwise you can't have the drama required for the film. Same principle here, the sound waves mean you can't have motorcycle chases while being bombed by drones which lets be honest looks a lot cooler than "quick point this speaker at him!" Carlton Drake from the life foundation knew about it but they also knew that it hurts the symbiotes quite extensively, so and he makes it very clear he treasures the symbiote more than humans by that stage... he would obviously prefer not to damage venom while bringing him in, and again he doesn't seem to care about a few human employees getting hurt in the process. This may have been something the directors overlooked, it is considered one of Venom's plot-holes. We do know that other groups have used sonic attacks against Venom. The Venom symbiote has two major weaknesses - sound and fire. Loud noises cause the symbiote to writhe in pain. That's how Peter Parker originally freed himself of the symbiote. A tolling church bell drove the two apart and sent the fleeing symbiote straight into the arms of an unsuspecting Eddie Brock. 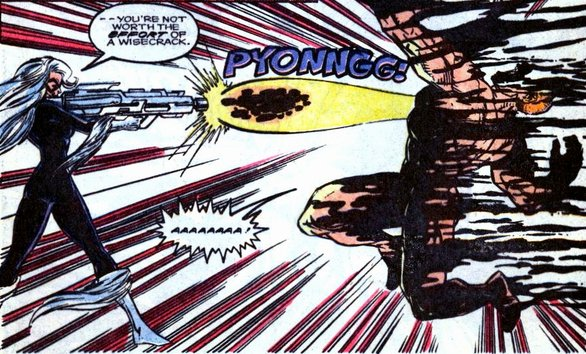 Even now, sonic weapons tend to be the first line of defense against Venom and his fellow symbiotes. So, to disagree with the other answer I believe that a sonic battle could have made quite a cool scene. So, in conclusion I believe that the producers somehow overlooked this part of the movie . Not the answer you're looking for? Browse other questions tagged plot-explanation venom . Why didn't The Strangers use female bodies? Why did Raymond receive the inheritance instead of Charlie?